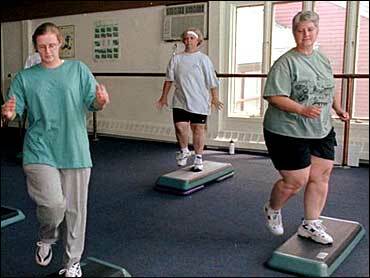 When people see Phyllis Warr, a short, stout woman who tips the scales at more than 250 pounds they assume she's out of shape - until she starts getting down on the dance floor. Cathy Davis Pannone weighs more than 300 pounds, but in the swimming pool she glides along with a grace that justifies her nickname - cat. The National Association to Advance Fat Acceptance has a new message to sell at its annual convention this week: Being fat doesn't mean you can't be fit. "We're large, we're in charge, we're out and we're proud," said Warr, a Chicago high school teacher who is among about 200 people attending the convention that runs through Sunday. "You have to show the world. You can't change the world unless you show them," Warr said. By throwing their weight around at yoga and water aerobics classes, dance parties and fashion shows, NAAFA members are hoping to wean the national debate on health away from its obsession with weight. "What we're being told now is that fat causes every (medical) problem," said Barbara Altman Bruno, a counselor and former NAAFA board member. "It's much too simplistic." Jeanette DePatie, a certified fitness instructor who proudly advertises her girth by calling herself "The Fat Chick" in her exercise video, said she's living proof that health and weight equate: she ran a marathon last year. "Take care of yourself the way you are," she says. Bruno advises overweight people to avoid expensive health clubs - which tend to have thinner members - and instead look to community gyms. While working out, she says, skip times that attract teenage boys. "They're the worst harassers," she said. Sandy Schaffer, a certified fitness instructor from New York, said doctors are stunned at how healthy she is. "They can look at my (test) numbers until they're blue in the face and they won't be convinced," she said. So call them fat, a word members use freely to help remove its stigma. Just don't call them couch potatoes. "We really need the medical community to focus on ways of making us healthy and not on making us thin," said Frances White, a San Francisco public television consultant and NAAFA board member.